Home / Unlabelled / MARRIAGE IN THE MONTH OF MUHARRAM - PROHIBITED OR NOT? 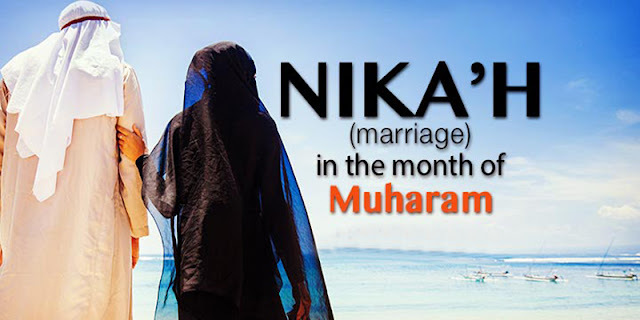 MARRIAGE IN THE MONTH OF MUHARRAM - PROHIBITED OR NOT? The basic principle is that things are permissible, unless there is a report to suggest otherwise. The basic shar‘i principle on which the scholars are unanimously agreed is that with regard to traditions and activities, the basic principle is that they are permissible so long as there is no evidence to suggest that they are forbidden. As there is nothing in the Qur’an or Sunnah, or scholarly consensus and analogy, or reports, to indicate that it is not allowed to get married in the month of Muharram, then our rulings and fatwas should be based on the ruling that it is basically permissible. The scholarly consensus that it is permissible is, at the minimum, a consensus of silence, as we have not found any of the earlier or later scholars, among the Sahaabah or Taabi‘een, or among the widely accepted imams and their followers until the present day, stating that it is haraam, or even makrooh, to get married or propose marriage in the month of Muharram. If anyone disallows that, it is sufficient evidence for rejecting his opinion to note that he has given a fatwa for which there is no evidence and which has not been suggested by any of the scholars. The month of Muharram is one of the venerated and honourable months of Allah. Concerning its virtue, it was narrated that the Prophet (blessings and peace of Allah be upon him) said: “The best of fasts after Ramadan is Allah’s month of Muharram.” Narrated by Muslim, 1163. It is the month that Allah has described as His, and has ordained that fasting during this month brings a greater reward than fasting in other months; therefore it is appropriate for a Muslim to seek the blessing of this month by doing such acts, and not to be sad or to fear getting married at that time, or to regard it as inauspicious, as was the custom during the Jaahiliyyah. There is no doubt that the day of the martyrdom of Husayn (may Allah be pleased with him) is a day of great calamity in the history of Islam, but it does not mean that we should rule it to be haraam to get married or propose marriage at that time. There is nothing in Islam to suggest that we should renew sorrow and grief in annual commemorations and continue morning to the extent that we forbid any expressions of joy. We are within our rights to ask the one who says that: Isn’t the day on which the Messenger of Allah (blessings and peace of Allah be upon him) died the greatest calamity that befell the Muslim ummah? So why is it not also haraam to get married during that entire month, namely Rabee‘ al-Awwal? Why hasn’t that ruling that it is haraam or makrooh been narrated from any of the Sahaabah or members of the Prophet’s household (Ahl al-Bayt), or the scholars after them? Similarly, if we were to renew our sorrow on every day on which one of the great leaders of Islam, from among the family (ahl al-bayt) of the Prophet (blessings and peace of Allah be upon him) or others, was killed or martyred or died, there would be too many such days to ever allow any day of joy and happiness, and the people would be burdened with unbearable hardship. Undoubtedly introducing innovations into the religion of Allah is, first and foremost, going to harm the people who go against Islamic teachings, those who think that they can add something to make Islam perfect (when it is already perfect), and are not content with it as it has been prescribed by Allah for His slaves. Shah Ismaa‘eel did not only use terror as a means of spreading Shi‘ism; rather he also employed other means, namely propagation and winning over people’s hearts and minds. He issued orders that ceremonies be organised to commemorate the murder of al-Husayn in the manner that is still followed now. This way of commemoration was originally introduced by the Buwayhids in Baghdad in the fourth century AH, but those who came after them had neglected this practice. Then finally Shah Ismaa‘eel came along and developed it and added to it the gatherings for mourning, in such a manner that they had a strong impact on people’s hearts. It may be true to say that this is one of the strongest factors in the spread of Shi‘ism in Iran, because of what they involve of expressions of grief and weeping, accompanied by large numbers of flags, beating the drums and so on, which leads to instilling the belief in people’s hearts on an emotional basis. End quote. Moreover, some historians regard it as most likely that ‘Ali ibn Abi Taalib (may Allah be pleased with him) married Faatimah (may Allah be pleased with her) at the beginning of 3 AH. Al-Bayhaqi quoted from al-Ma‘rifah by Abu ‘Abdullah ibn Mandah that ‘Ali married Faatimah one year after the Hijrah, and consummated the marriage with her one year after that. According to this view, the consummation of his marriage to her occurred at the beginning of 3 AH. There are also other opinions concerning this issue, but the point is that none of the scholars ever objected to marriage in Muharram; rather the one who marries at that time has a good example in Ameer al-Mu’mineen ‘Ali and his marriage to as-Sayyidah Faatimah, the daughter of the Messenger of Allah (blessings and peace of Allah be upon him).